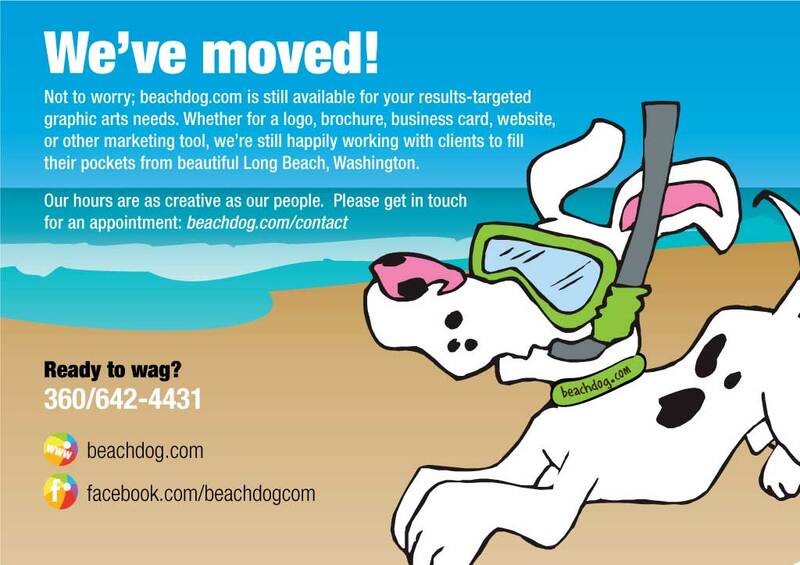 Not to worry; beachdog.com is still available for your results-targeted graphic arts needs. Whether for a logo, brochure, business card, website, or other marketing tool, we’re still happily helping clients fill their pockets from beautiful Long Beach, Washington. Where is your office now? While it’s certainly no secret, we aren’t being liberal in publishing our address because we now have office hours by appointment rather than drop-in. You can find us at 706 Washington Ave N in Long Beach, across from the Long Beach Fire Hall and Stanley Field–by appointment! Over the past several years, we’ve made a shift from employees to long-term subcontractors. We simply don’t need the space -or the overhead- of our commercial building. Are you leaving the Peninsula? We’ve been working with clients world-wide since 1997 and expect to continue doing so for many years to come. We’re blessed to be in a business that allows us to work from anywhere and we choose the incredible Long Beach Peninsula. This breathtakingly beautiful place is so very rich with fun activities, natural resources, and quality people. We LOVE it here in teeny, tiny, Tinkertown! Are you selling the building? What is happening to your building? It is not for sale at this time, but interesting offers are always welcome! Our friends at Willapa Behavioral Health will soon be taking occupancy as part of their expansion of services. We’re delighted to have them as long-term tenants.